On the way to the movie the other day, my son and I spied this car in the lot. 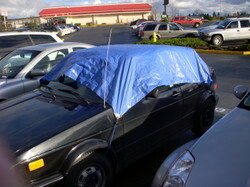 We figured that these people probably have a leaky sunroof or something, so they have to tarp up when they go anywhere. 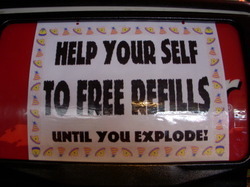 For some reason, I found this to be very funny. That is not a good feature to have on a car in rainy Western Washington. There I was, minding my own business, just watering the kiwis and I noticed this buzzing noise. 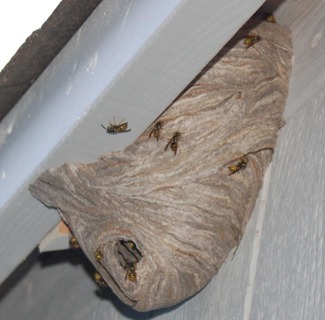 I looked up and there was this humongous hornets' nest. It materialized in no more than two days. I actually think they put it up just today, but I can't be 100% sure so I'm giving them an extra day. Amazing, but not so amazing that I'm not going to spray the heck out of it as soon as it gets dark and the hornets and their stingers are all happily tucked away for the night. How Much Soda Can You Drink? 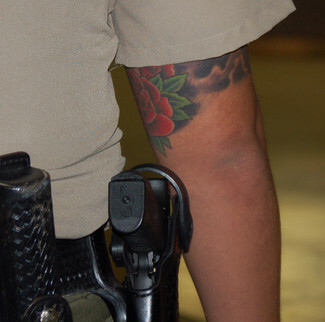 Spied this on the arm of an Orange County Sheriff in John Wayne International Airport. Guns and Roses, baby. 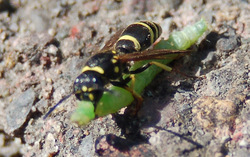 Those little tuna-eating yellow jackets are back. I was sitting outside in the sun when this insect flies by that looked totally unfamiliar. 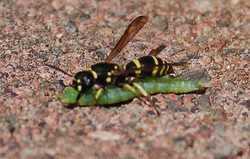 Upon closer inspection, it was a yellow jacket carrying a bright green caterpillar. The bee would land and munch on the bug for a bit, take off and then land again and munch some more. These are the same bees that pester us every year when we have our annual (except for this year) Polynesian Style Pig Roast. When the pig was out of the ground and being carved, the yellow jackets would move in and swarm around the meat. It was a pain and we were contstantly swatting them out of the way. These are the same bees that also enjoyed the albacore tuna I canned in August. A friend told me about a party she had attended along with their own pesky yellow jackets. Many of the yellow jackets had been swatted to the ground and then stomped on and killed. She said other yellow jackets would then come and get their squished compadres and fly away with them. I don't know if they are really bees, yellow jackets, wasps, or what. I do know that seeing one buzzing around with a caterpillar longer than it's entire body is a freaky thing to see. These pictures could be better. It's time to get a macro lens for the camera. When we were in Florence, we stayed at the Hotel Londra. It was an early 20th century hotel about three blocks from the train station. While it was old and rather threadbare, the staff was really nice, it was clean and easy to get to from the train station. It was also an easy walk to everything we wanted to see. Next to the hotel there was a high end women's clothing store that had THIS couch was in the entry way. A fully taxidermied cow... complete with hooves and erect tail, eyes, horns, nose...the whole steer... Ha!! 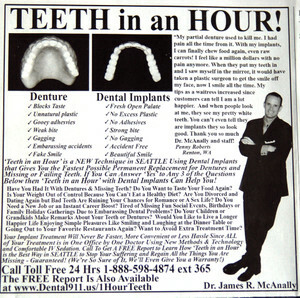 ...one of the freakiest things I ever saw.